Published by B. McKenzie at 12:06 pm under Superhero Nation,superhero satire,Superhero Stories,there's no time! This next one is dedicated to a certain fictional counterterrorist we all know and love, rather than anything in real-life. My last fake card was done like a Magic: The Gathering card. It’s come to my attention that there are superhero card games (!). One of my Australian (!!!) readers says that he has actually played one, OverPower. He says: “Your art [expletive]s but I bet Hegemon will be funner to play than” Overpower. In honor of this alleged card game that has apparently made its way to Australia already, I give you your second Hegemon card, There’s No Time! (Please click to see the full image if it’s cut off). 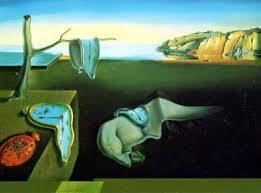 To the extent that the art is not painfully bad, I made use of Dali’s classic Persistence of Memory.